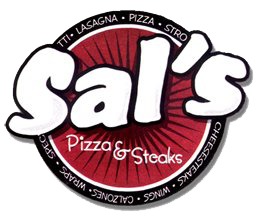 Online ordering menu for Sal's Pizza Steak. At Sal's Pizza & Steaks we strive to make the best food for our customers. Our goal is for every costumer to walk out satisfied and happy with what they ordered. Your food will always be made to order and with fresh ingredients. If you have a special request, rest assured that Sal's can make it for you. Try some of our Sal's Specialty Pizzas like the "Kain Pizza" or our "Brooklyn Style Pizza" or create your own masterpiece! We not only offer the best pizza we also offer Cheesesteaks, Sicilian Pies, Calzones, Sandwiches, Wings, Soups & Salads, Desserts and much more! We hope everyone will be able to enjoy their Sal's experience. We are located at 1111 Easton Road in the Warrington Pavillion Shopping Center, just 10 minutes north of Horsham Air Guard Station. Place your online order today for quick and easy carryout or delivery!